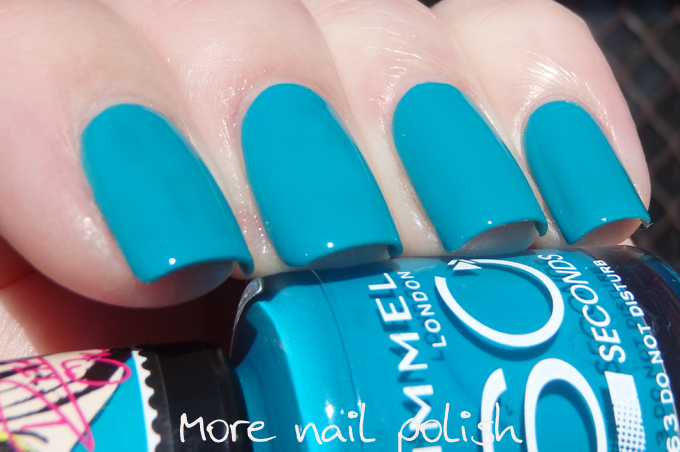 Rimmel London has a collection of six new polishes by British singer, songwriter and actress Rita Ora. The new polishes hit Australian stores this month and I have swatches of the three bright colours to show you tonight, together with a nail art look I created using the polishes. I will have the three pastel shades tomorrow. 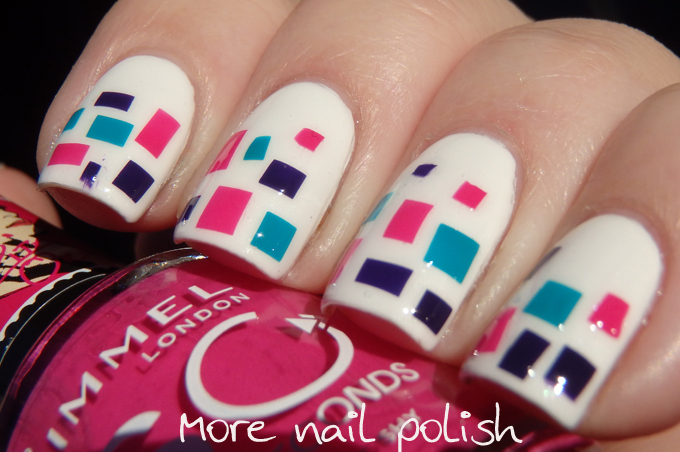 I actually only own one or two Rimmel London polishes, and they are ones that I purchased many, many years ago, so I was pretty keen to try these out. 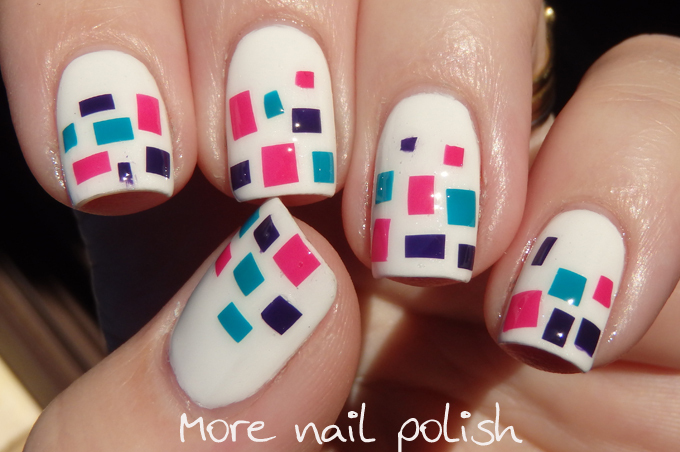 First up, I want to share my nail art, cause I think it looks pretty fun! I was inspired by an Instagram tutorial by @yagala to create this look, and I have to say it is so easy that anyone can do it. I started with a white base. Then for the rectangle shapes I just painted a small square about 2cm x 2cm of each feature colour onto a piece of plastic (I used a zip lock bag). I also top coated them with some Seche Vite to speed up the drying time on the plastic. When they were dry, I peeled them up and simply cut them up with a pair of scissors. 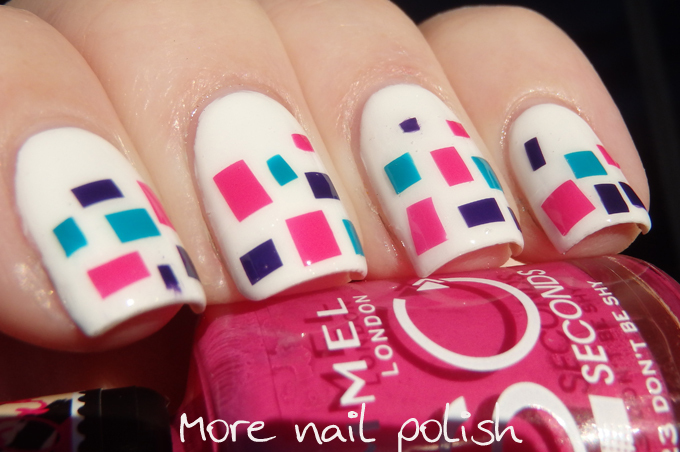 I then placed random rectangle shapes onto each nail into a layer of fresh top coat. Now lets look at each of these shades on their own. Do Not Disturb - a smooth, well pigmented teal creme. The formula was great and full glossy coverage was achieved at two thin coats. These polishes all have those really wide brushes that have a curved tips to help make the edge near the cuticle as neat as possible. I'm not used to using such a wide brush, but I didn't find it too hard to adapt. 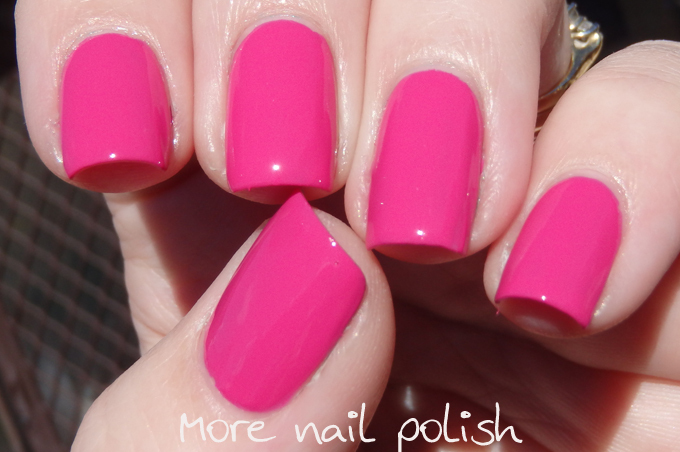 Don't Be Shy - Bright, richly pigmented pink creme. Again the formula was good. This is two coats with Seche Vite top coat. 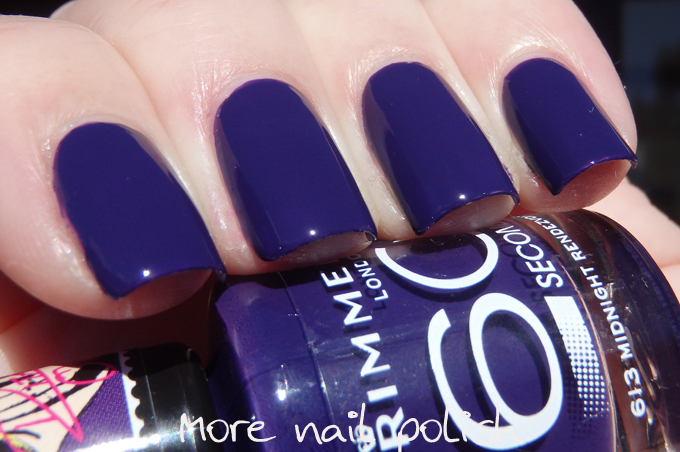 Midnight Rendezvous - a dark and rich purple creme. Nice formula and coverage. Such a beautiful shade of purple. This is two coats with Seche Vite top coat. 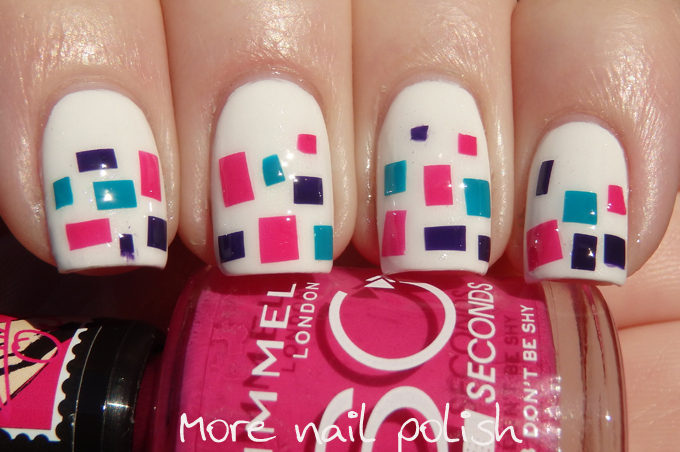 These polishes were a delight to swatch. They dried quickly and were richly pigmented and opaque at two coats. The colors are also gorgeous, so they get a thumbs up from me. 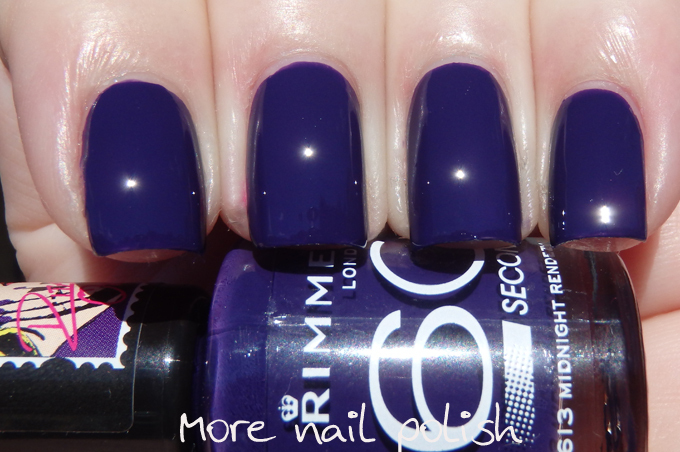 The Rimmel London Colour Rush 60 Seconds Nail Polish has a RRP of $7.95 and are available from this month from Priceline, Priceline Pharmacy, Target, Kmart, BigW, selected pharmacies and selected Coles and Woolworths. For stockists call 1800 812 663. Bubbles and gradient and glitter, oh my! Bright bubbles - sort of!